In her soon-to-be-published second collection of poetry, titled "Permanent Change of Station," Lisa Stice lovingly interrogates and illuminates life in a military family with a young daughter—exploring the in-betweens of separation and connection, and the quest for finding one’s place in the world. With an anticipated on-sale date of April 23, 2018, "Permanent Change of Station" (100 pages, Middle West Press LLC) will be available in a $11.99 trade paper edition through Amazon and other booksellers, as well as a $5.99 e-book exclusively via Amazon. Stice's signature style frequently involves the borrowing of words from texts she finds readily at hand, including quotations from Sun Tzu's "The Art of War," and Dr. Seuss's "The Sneetches." In her new poems, the family’s small dog Seamus also often appears as sentry, companion, and guide. "Given that April is both the Month of the Military Child, and National Poetry Month, we can think of no better voice to celebrate than that of Lisa Stice," says Randy Brown, editor and publisher of Middle West Press LLC. 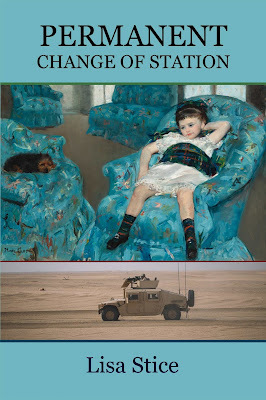 "Her close observations of childhood magic and household routines, quietly set against ever-present question-marks of war and displacement, are essential and timely insights into the modern military family experience." "If you’ve ever been a military kid, parent, or spouse—regardless of age or era—you’ll find a welcome home in her words." Lisa Stice is the author of a previous poetry collection, "Uniform" (Aldrich Press, 2016), in which she explores her experiences as a military wife. A former high school teacher, she volunteers as a mentor with the Veterans Writing Project; as an associate poetry editor with 1932 Quarterly; and as a contributor for The Military Spouse Book Review. She received a BA in English literature from Mesa State College (now Colorado Mesa University), Grand Junction, Colo., and an MFA in creative writing from the University of Alaska, Anchorage. While it is difficult to say where home is, she says, Stice currently lives in North Carolina with her husband, her daughter, and Seamus, a Norwich Terrier. For a Red Bull Rising review of Stice's previous book, click here. For a "5 Questions" Aiming Circle interview with poet Lisa Stice, click here. Middle West Press LLC is a Central Iowa-based editor and publisher of non-fiction, fiction, journalism, and poetry. As an independent micro-press, we publish one to four titles annually. Our projects are often inspired by the people, places, and history of the American Midwest, as well as other essential stories. The press has previously published two collections from other poets, who offer unique perspectives on war or military themes: "Welcome to FOB Haiku: War Poems from Inside the Wire" (2015) by Randy Brown; and "Hugging This Rock: Poems of Earth & Sky, Love & War" (2017) by Eric Chandler.